The spotted owlets in my city have been very choosy about their nesting areas towards the end of a fiery summer. The heat and humidity have seen them disappear from regular spots. It has been a challenge to find one. I have been sullen about it given all the luck I have had with them before . They have found themselves a special place in my heart; one with spots, I presume. Hence it has weighed on my mind, rather heavily, that they have been recently amiss. It has even had me distracted about the nuisances of summer. I wasn’t bothered too much about the humidity or the mosquitoes. I had bigger problems. I hadn’t spotted an owl since May 14. I had been returning empty-hearted from all my recent birding trails. Thankfully I saw one two sunrises ago on the Pulicat road. I spotted her on a branch of a palm tree. I parked the car as silently as I could, and tip-toed out of her range of sight. I chuckled in excitement when I realized her eyes were closed. I took a few photographs. But then a speeding taxi woke her up. When she finally made eye contact – there was music in the air. Her tail-feathers bristled as she bobbed her head to the rhythm. A burst of wind gnawed my ears. My fingers shook under the weight of the camera. I shot a few more before things could become too emotional. It kind of did. I sat down by the edge of road as we stared at each other. The moment passed only when an annoyed bus driver cursed at one of us. My heart was full though. I saw another Spotted Owlet about two kilometers down the road. An older one, with eyes like the madness in cooled-down ember. We only shared a minute or so. I quietly drove away, leaving her in peace. It was as though there wasn’t enough love in me left to give after all the first one. It got me thinking about how we often have a lot of love to give but we put it in the wrong places. Eventually we find the right one and we put everything we have in it. And then if it’s time to leave, for whatever the reasons maybe, we end up with nothing more left to give anyone else. I hope I prove myself wrong the next time I see an owl. A spotted part in my heart tells me I will. 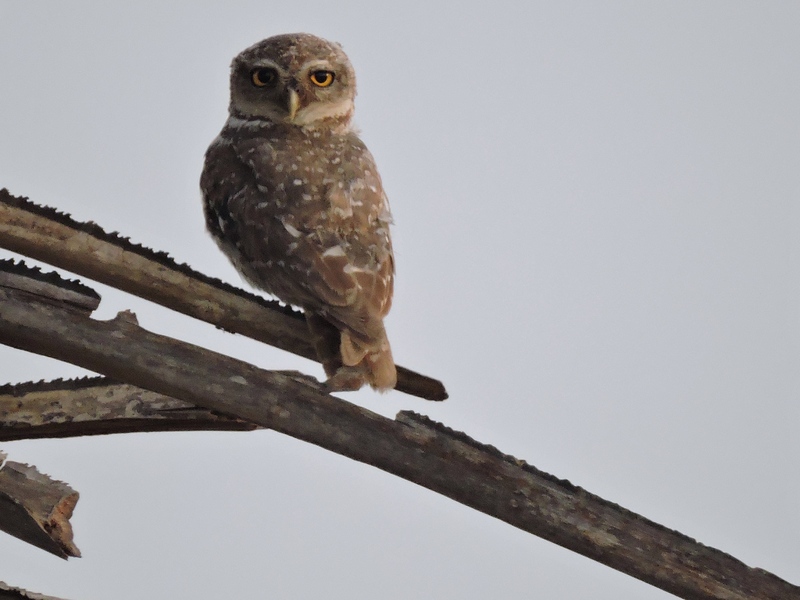 The Spotted Owlets featured were photographed at Vedanthangal Bird Sanctuary and Pulicat Road. Wow, what a smart-looking bird! I wonder why its name is used for foolish people! “Ullu”! And hey, the words resonate with the pictures so perfectly! Bird-brained, cunning as a fox, crazy cuckoo, dog (without even an adjective!) and so on… it’s sad how much of a statement we make with our expletives. Sharing something about why an owl looks so smart! Dog used for swearing is weird…ironical. Dogs are so faithful, honest, loyal, love their masters so much…or anyone who gives them food. I wonder why ppl take offence when they are called…”You are such a dog”. yeah man i’d smile and say “thank you, could you throw me a bone now please”! Would be better with some juicy chicken around it! Thank you so much Uma. Lady luck has definitely been kind to me! My new ambition in life: Meet an owliekins in person and pay obeisance before I die. Aren’t they anna! Next time you are in chennai, I shall introduce you to my spotted fraaands! I’m glad you stayed long enough for the bus driver to be annoyed by your prolonged presence. (That’s how you know you’re spending enough time with the birds. When others get perturbed by it.) I especially liked the single one in the window framed by lantana. Is the CoolPix your preferred camera? Great shots. Owls have been the most elusive for me. Only the Barred Owl regular while camping out back or sleeping inside with windows open (http://wp.me/p28k6D-Wj one video’s mine, the other is their call), but not seen. There are at least two other species that I MUST see with my own eyes before the end of the year (Eastern Screech, Great Horned). This post brings that to the foreground for me. Need to step up my birdie game! Be well, Christy. Too much cuteness to handle!! Lovely pictures (especially the first one)- itching to see one of these beauties in the wild. Aww the first one is called eyewin, I ll pass the compliment to him! Hope you spot one soon and write about it, L. Owls are just the cutest! Aww that’s fantastic! Really like your feline photography and catty captions, much love.